, one of the most celebrated philosophers of antiquity, the real merit of whose system, however, still remains doubtful, was an Athenian of the Egean tribe, and born at Gargettus, in the vicinity of Athens, at the beginning of the third year of the 109th oh mpiad, or B. C. 344. His father Neocles, and his mother Chaerestrata, were of honourable descent, but being reduced to poverty, they were sent with a colony of 2000 Athenian citizens, to the island of Samos, which Pericles had subdued, to divide the lands among them by lot; but wljat fell to their share not proving sufficient lor their subsistence, Neocles took up the profession of a schoolmaster. Epicurus remained at Samos till he was eighteen years of age, when he removed to Athens, which the tyranny of Perdiccas soon made him leave; but after passing one year at Mitylene, and four at Lampsacus, he returned to Athens. | From his fourteenth to his thirty-sixth year, he studied under the various philosophers of his day, and therefore when we read in Cicero that he boasted he was a selftaught philosopher, we are to understand only that his system of philosophy was the result of his own reflections, after comparing the doctrines of other sects. About th thirty-second year of his age he opened a school at Mitylene, which he soon removed to Lampsacus, where he had disciples from Colophon, but not satisfied with this obscure situation, he determined to make his appearance on the more public theatre of Athens. Finding, however, the public places in the city proper for this purpose, already occupied by other sects, he purchased a pleasant garden, where he took up his constant residence, and taught his system of philosophy; and hence the Epicureans were called the Philosophers of the Garden. Besides this garden, Epicurus had a house in Melite, a village of the Cecropian tribe, to which he frequently retreated with his friends. From this time to his death, notwithstanding all the disturbances of the state, Epicurus never left Athens, unless in two or three excursions into Ionia to visit his friends. During the siege of Athens by Demetrius, which happened when Epicurus was forty -four years of age, while the city was severely [harassed by famine, Epicurus is said to have supported himself and his friends on a small quantity of beans, which he shared equally with them. The period in which Epicurus opened his school was peculiarly favourable to his design. In the room of the simplicity of the Socratic doctrine, nothing now remained but the subtlety and affectation of stoicism, the unnatural severity of the Cynics, or the debasing doctrine of indulgence taught and practised by the followers of Aristippns. The luxurious refinement which now prevailed in Athens, inclined the younger citizens to listen to a preceptor who smoothed the stern brow of philosophy, and, under the notion of pleasure, led them unawares to moderation and virtue. Hence his school became exceedingly popular, and disciples flocked into the garden, not only from different parts of Greece, but from Egypt and Asia. Those who were regularly admitted into this school lived upon such a footing of friendly attachment, that each individual cheerfully supplied the necessities of his brother. Cicero describes the friendship of the Epicurean fraternity as unequalled in the history of mankind. | That he might prosecute his philosophical labours with the less interruption, Epicurus lived in a state of celibacy. In his own conduct he was exemplary for temperance and continence, and he inculcated upon his followers severity of manners, and the strict government of the passions, as the best means of passing a tranquil and happy life. Notwithstanding his regular manner of living, towards the close of his days, probably in consequence of intense application to study, his constitution became infirm, and he was afflicted with the stone. Perceiving from these marks of decay that his end was approaching, he wrote a will, in which he bequeathed his garden, and the buildings belonging to it, to Hermachus, and through him to the future professors of his philosophy. 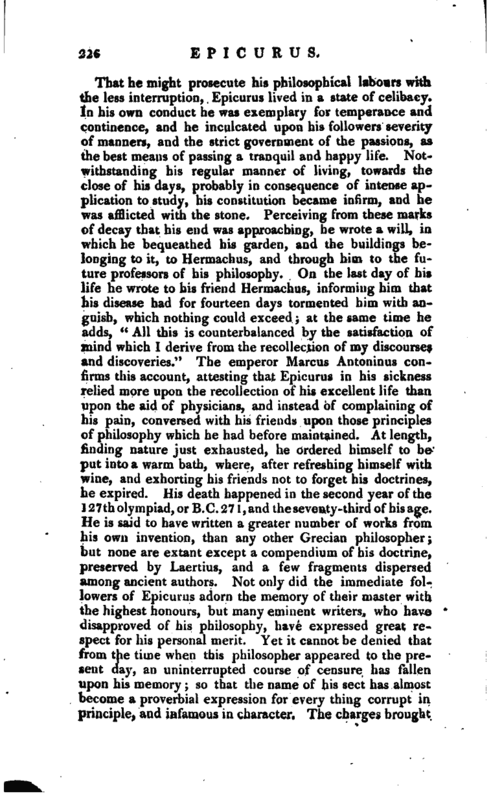 On the last day of his life he wrote to hi friend Hermachus, informing him that his disease had for fourteen days tormented him with anguish, which nothing could exceed; at the same time he adds, “All this is counterbalanced by the satisfaction of mind which I derive from the recollection of my discourses and discoveries.” The emperor Marcus Antoninus confirms this account, attesting that Epicurus in his sickness relied more upon the recollection of his excellent life than upon the aid of physicians, and instead of complaining of his pain, conversed with his friends upon those principles of philosophy which he had before maintained. At length, finding nature just exhausted, he ordered himself to be put into a warm bath, where, after refreshing himself with wine, and exhorting his friends not to forget his doctrines, he expired. His death happened in the second year of the 127th olympiad, or B.C. 271, and the seventy-third of hisage. He is said to have written a greater number of works from his own invention, than any other Grecian philosopher; but none are extant except a compendium of his doctrine, preserved by Laertius, and a few fragments dispersed among ancient authors. Not only did the immediate followers of Epicurus adorn the memory of their master with the highest honours, but many eminent writers, who have disapproved of his philosophy, have expressed great respect for his personal merit. Yet it cannot be denied that from the time when this philosopher appeared to the present day, an uninterrupted course of censure has fallen upon his memory; so that the name of his sect has almost become a proverbial expression for every thing corrupt in principle, and infamous in character. The charges brought | against Epicurus are, that he superseded all religious principles, by dismissing the Gods from the care of the world; that if he acknowledged their existence, it was only in conformity to popular prejudice, since, according to his system, nothing exists in nature but material atoms; that he discovered great insolence and vanity in the disrespect with which he treated the memory of former philosdphers, and the characters and persons of his contemporaries; and that both the master and the whole fraternity were addicted to the vilest and most infamous vices. These accusations against the Epicurean school have been more or less confirmed by men distinguished for their wisdom and virtue, by Zeno, Cicero, Plutarch, Galen, and many of the Christian fathers. By what, therefore, are they to be repelled Brucker, who has examined this question with, his usual acuteness and erudition, observes, that with respect to the first charge, that of impiety, it certainly admits of no refutation. 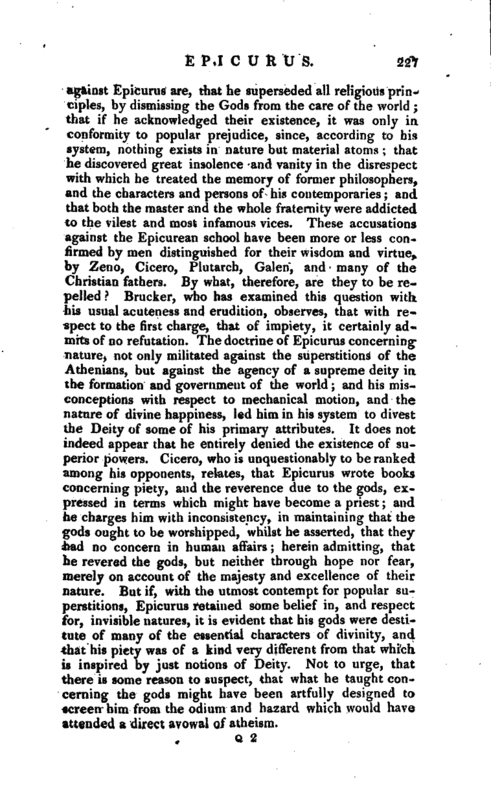 The doctrine of Epicurus concerning nature, not only militated against the superstitions of the Athenians, but against the agency of a supreme deity in the formation and government of the world; and his misconceptions with respect to mechanical motion, and the nature of divine happiness, ld him in his system to divest the Deity of some of his primary attributes. It does not indeed appear that he entirely denied the existence of superior powers. 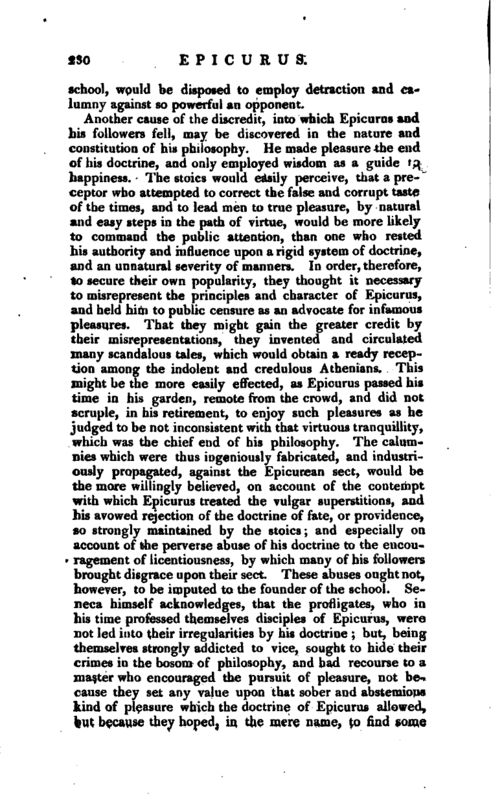 Cicero, who is unquestionably to be ranked among his opponents, relates, that Epicurus wrote books concerning piety, and the reverence due to the gods, expressed in terms which might have become a priest; and he charges him with inconsistency, in maintaining that the gods ought to be worshipped, whilst he asserted, that they had no concern in human affairs; herein admitting, that he revered the gods, but neither through hope nor fear, merely on account of the majesty and excellence of their nature. 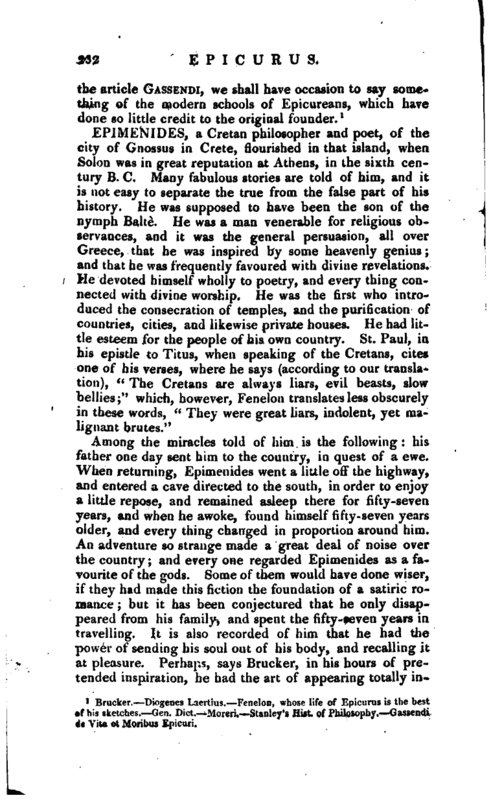 But if, with the utmost contempt for popular superstitions, Epicurus retained some belief in, and respect for, invisible natures, it is evident that his gods were destitute of many of the essential characters of divinity, and that his piety was of a kind very different from that which is inspired by just notions of Deity. Not to urge, that there is some reason to suspect, that what he taught concerning the gods might have been artfully designed to screen him from the odium and hazard which would have attended a direct avowal of atheism. | The second charge against Epicurus, that of insolence and contempt towards other philosophers, seems scarcely compatible with the general air of gentleness and civility which appears in his character. If he claimed to himself the credit of his own system, he did no more than Zeno, Plato, and Aristotle, after availing themselves of every possible aid from former philosophers, had done before him. But, adds Brucker, calumny never appeared with greater effrontery, than in accusing Epicurus of intemperance and incontinence. That his character was distinguished by the contrary virtues appears not only from the numerous attestations brought by Laertius, but even from the confession of the most creditable opponents of his doctrine, particularly Cicero, Plutarch, and Seneca; and indeed this is sufficiently clear from the particulars which are related concerning his usual manner of living. But nothing can be a greater proof that his adversaries had little to allege against his innocence, than that they were obliged to have recourse to forgery. The infamous letters which Diotimus, or, according to Athcnucus, Theotimus, ascribed to him, were proved, in a public court, to have been fraudulently imposed upon the world, and the author of the imposition was punished. Whatever might be the case afterwards, therefore, there is little reason to doubt that, during the life of Epicurus, his garden was rather a school of temperance, than a scene of riot and debauchery. 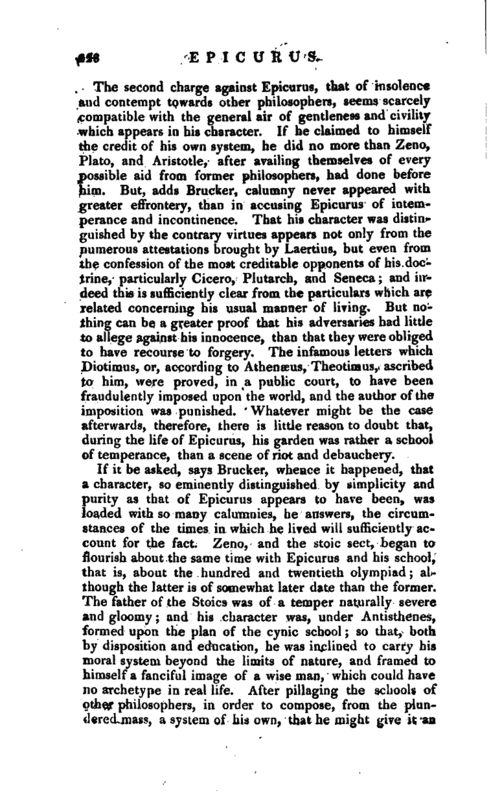 If it be asked, says Brucker, whence it happened, that a character, so eminently distinguished by simplicity and purity as that of Epicurus appears to have been, was loaded with so many calumnies, he answers, the circumstances of the times in which he lived will sufficiently account for the fact. Zeno, and the stoic sect, began to flourish about the same time with Epicurus and his school, that is, about the hundred and twentieth olympiad; although the latter is of somewhat later date than the former. The father of the Stoics was of a temper naturally severe and gloomy and his character was, under Antisthenes, formed upon the plan of the cynic school so that, both by disposition and education, he was inclined to carry his moral system beyond the limits of nature, and framed to himself a fanciful image of a wise man, which could have no archetype in real life. After pillaging the schools of other philosophers, in order to compose, from the plundered mass, a system of his own, thut he uiight give it an | air of novelty, he introduced new terms, or affixed new significations and definitions to the old; whence arose dogmas, which had indeed little originality, but which under, a paradoxical form carried the appearance of profound wisdom. By these means, together with the external aid of uncommon gravity in language, dress, and demeanour, Zeno and his followers obtained such high reputation among the Athenians, that they were the only persons deemed worthy of the name of philosophers. The temper of Epicurus, and the character under which he chose to appear, was the reverse of all this. In his natural disposition lively and cheerful, and accustomed, from his infancy, to mix in society with men of all descriptions, he had acquired a captivating facility "of address, and urbanity of manners. Nothing could be more contrary to his disposition and habitude, than the artificial reserve, and hypocritical affectation of the stoics. His aversion to unnatural austerity, and artificial grimace, induced him to open his garden in direct opposition to the Porch. Observing that all the Athenians were at this time immersed either in pleasures or in ideal and useless disputes, he attempted to lead them to such an employment of their rational faculties as would be conducive to the true enjoyment of life; and for this purpose introduced among them a system of philosophy, the professed object of which was, to enable men to preserve themselves from pain, grief, and sorrow of every kind, and to secure to themselves the uninterrupted possession of tranquillity and happiness. This great end he assured himself would be effected, if, by taking off the forbidding mask with which the Stoics had concealed the fair face of virtue, he could persuade men to embrace her as the only guide to a happy life. 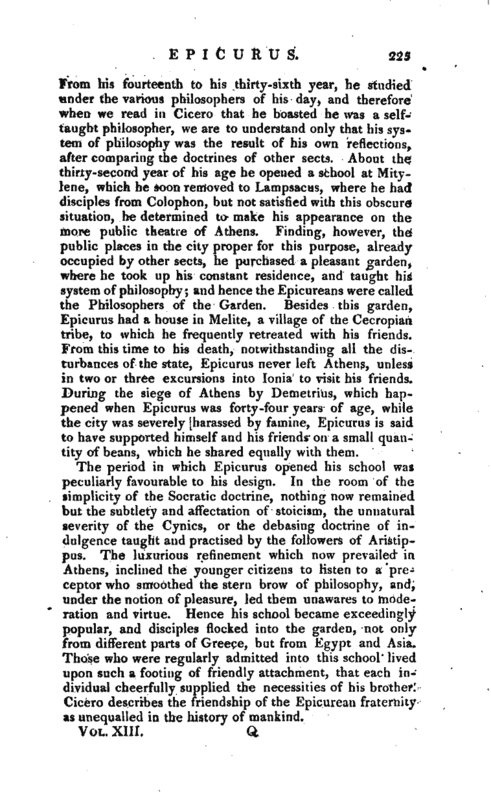 At the same time Epicurus was convinced, that the subtlety of disputation would contribute little towards the accomplishment of his design; and therefore endeavoured to divert the public taste from these trifling occupations, and to put an end to the verbal contests of the academics, dialectics, and stoics, by instituting a school, in which greater caution than had hitherto been customary should be exercised in the assumption of principles, and in the use of terms. The natural consequence of this was a crowded school to Epicurus, and jealousy and envy among his contemporaries. The stoics, above all others, in opposition to whom he had erected his | school, would be disposed to employ detraction and calumny against so powerful an opponent. Another cause of the discredit, into which Epicurus and his followers fell, may he discovered in the nature and constitution of his philosophy. He made pleasure the end of his doctrine, and only employed wisdom as a guide to happiness. The stoics would easily perceive, that a preceptor who attempted to correct the false and corrupt taste of the times, and to lead men to true pleasure, by natural and easy steps in the path of virtue, would be more likely to command the public attention, than one who rested his authority and influence upon a rigid system of doctrine, and an unnatural severity of manners. In order, therefore, to secure their own popularity, they thought it necessary to misrepresent the principles and character of Epicurus, and held him to public censure as an advocate for infamous pleasures. That they might gain the greater credit by their misrepresentations, they invented and circulated many scandalous tales, which would obtain a ready reception among the indolent and credulous Athenians. This might be the more easily effected, as Epicurus passed his time in his garden, remote from the crowd, and did not scruple, in his retirement, to enjoy such pleasures as he judged to be not inconsistent with that virtuous tranquillity, which was the chief end of his philosophy. The calumnies which were thus ingeniously fabricated, and industriously propagated, against the Epicurean sect, would be the more willingly believed, on account of the contempt with which Epicurus treated the vulgar superstitions, and Iris avowed rejection of the doctrine of fate, or providence, so strongly maintained by the stoics; and especially on account of the perverse abuse of his doctrine to the encouragement of licentiousness, by which many of his followers brought disgrace upon their sect. These abuses ought not, however, to be imputed to the founder of the school. 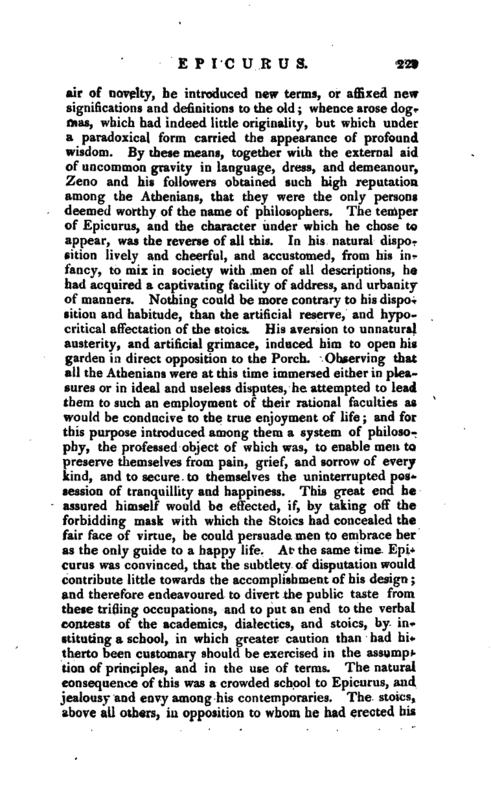 Seneca himself acknowledges, that the profligates, who in his time professed themselves disciples of Epicurus, were not led into their irregularities by his doctrine; but, being themselves strongly addicted to vice, sought to hide their crimes in the bosom of philosophy, and had recourse to a master who encouraged the pursuit of pleasure, not because they set any value upon that sober and abstemious ivind of pleasure which the doctrine of Epicurus allowed, but because they hoped, in the mere name, to find some | pretext or apology for their debaucheries. If these circumstances be duly considered and compared, it will no longer appear strange, that many eminent men, who had addicted themselves to other schools, have given an unfavourable judgment concerning Epicurus, whilst the force of truth has sometimes led them, at the expence of their own consistency, to attest his merit. 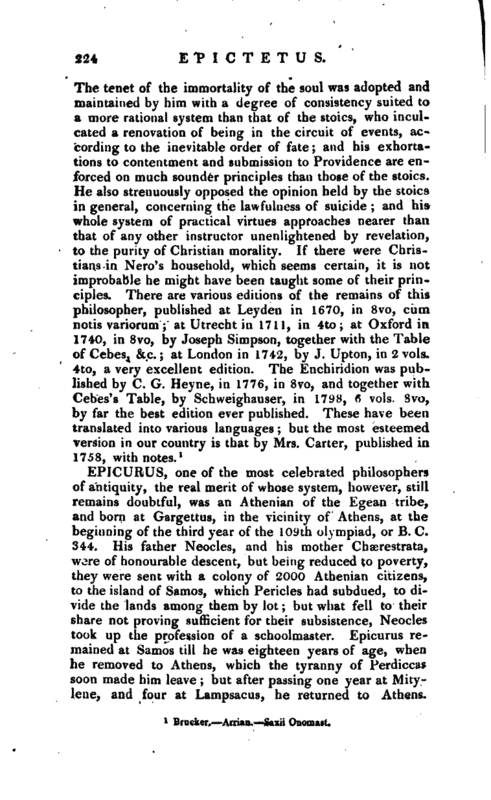 Others, however, have penetrated through the thick cloud of calumny, which has hung over the character of Epicurus, and, in opposition to the general current of censure, have ventured to give him that praise, which, amidst all the absurdities of his speculative system, was so justly due to his personal virtues, and to his laudable attempts to conduct men, by innocence and sobriety, to the tranquil enjoyment of life. Notwithstanding the violent opposition which Epicurus met with from the stoics, he had many friends and followers during his life; and after his death a degree of respect was paid to his memory, which fell little short of idolatry. His three brothers, Neocles, Cheredemus, and Aristobulus, devoted themselves to the study of philosophy, and were supported by his liberality. Of his intimate friends the most celebrated were, Metrodorus, Polyaenus, and Hermacnus. After the death of Epicurus, his followers celebrated his birth-day as a festival. They preserved his image on their rings or cups, or in pictures, which they either carried about their persons, or hung up in their chambers; and so great was their reverence for his authority, and their regard to his dying advice, that they com-p mitted his maxims, and some of them the whole body of Lis instructions, to memory. 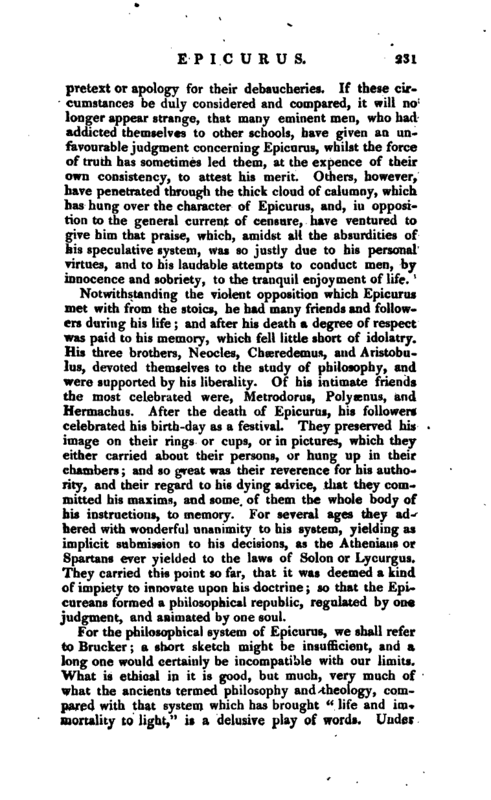 For several ages they adhered with wonderful unanimity to his system, yielding as implicit submission to his decisions, as the Athenians or Spartans ever yielded to the laws of Solon or Lycurgus, They carried this point so far, that it was deemed a kind of impiety to innovate upon his doctrine; so that the Epicureans formed a philosophical republic, regulated by one judgment, and animated by one soul. Brucker.—Diogenes Laertius.—Fenelon, whose life of Epicurus is the best of his sketches.—Gen. Dict.—Moreri.—Stanley’s Hist. of Philosophy—Gassendi de Vita et Moribus Epicuri.